You don’t have to break the bank to look your best! #1. Plan to donate your hair. Are you planning on parting with several inches of your hair? If so, it might be a good idea to donate it. There are many organizations, including Locks of Love, that use donated hair to make wigs for people battling cancer and other diseases. Not only will donating allow you to give to a good cause, it may also help you save on a haircut because some salons offer discounts for donating. #2. Look for deals online. Before you schedule an appointment at a salon, look at coupon sites, like Groupon or Living Social. These sites often have great deals on a variety of salon services, from haircuts to waxing, and you may even find discounts on salon quality products. #3. Ask to work with an entry-level stylist. Saving on haircuts does not mean that you have to go to a walk-in salon or resort to cutting your own hair. 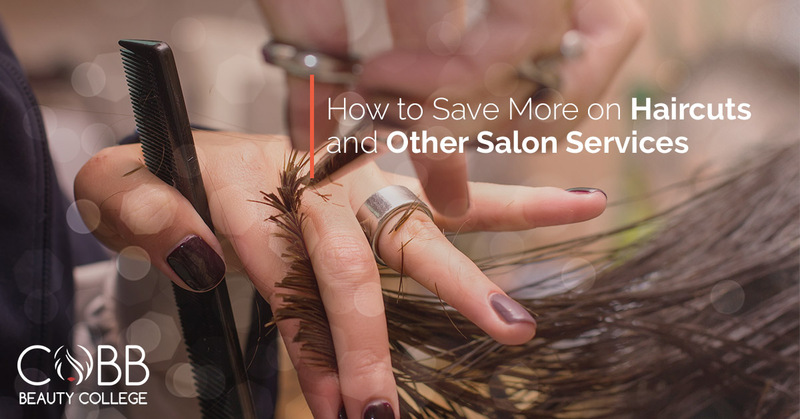 You can still save more and get your hair cut at a high-end salon if you ask to work with an entry-level stylist. Many high-end salons have tier pricing: the most experienced, sought-after stylists are more expensive, whereas the newer stylists are often available at much more affordable rates. #4. Cash in on referral incentives. For a salon, it’s often much cheaper to bring in new customers with referrals than with traditional marketing, and some will even incentivize their clients to refer friends and families by offering discounts. The next time you go to the salon, ask them if there are any discounts or other incentives you can take advantage of by referring your friends and family. #5. Go to a beauty school! Visiting your local beauty school is, hands down, the best way to save on haircuts, color, waxing, facials, manicures and all other salon services. Beauty schools, like Cobb Beauty College, offer a variety of salon services at deeply discounted prices. Visiting your local beauty school in Kennesaw not only allows our students to have the opportunity to perfect their skills, it allows you to enjoy salon quality services at a much lower price. And since a licensed instructor oversees every service we offer, you can rest assured that you’re in good hands. Want to start saving more on salon services? Schedule your appointment with Cobb Beauty College today!